The following project is the submitted proposal of “USEarchitecture” for the “Blue Award Competition” organized by the University of Vienna. 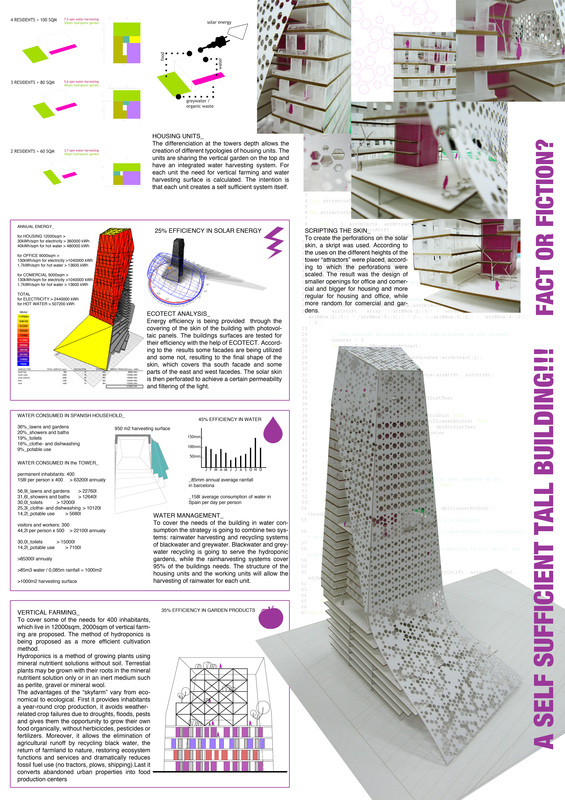 It was accomplished during Maria Koutsari’s studies in the Institute of Advanced Architecture in Barcelona in 2008-2009. The project raises the issue of sustainability of tall buildings and tries to explore a new typology of self-sufficient buildings, that are multifunctional and form a new type of vertical neighborhood. The proposal is based on the idea of three levels of self-sufficiency: social, economical and ecological. Apart from the multifunctional character of the building this is achieved through the implementation of rainwater harvesting systems on the facade, solar energy harvesting skin on the south front of the building and vertical gardens on the upper floors of the building for food cultivation. All the above form an autonomous cycle that allows the inhabitants to evolve to a certain extent a self-sufficient lifestyle, in terms of cultivating their own food and using for their everyday needs renewable energy resources.